That Davidson last name, of course, is half of the iconic product that is celebrating its 115th birthday this year. The other half of the name is Harley. Harley-Davidson. At the Harley-Davidson Museum in Milwaukee, you can almost hear the vroom of powerful motorcycle engines seeming to echo down the highways of time. The story of those men and the legendary machines they created is told through hundreds of motorcycles and memorabilia. Opened in 2008 in the town where the famous bikes were born, the museum has become one of Milwaukee’s top attractions. The story began in the early 1900s when 21-year-old William S. Harley sketched plans for a motor-bicycle engine. He teamed up with the Davidson brothers – Arthur, Walter and William – to build a functioning motorcycle. “They did it in a small wooden shed in the Davidson’s backyard here in Milwaukee,” says Kristen Jones, lead curator for the museum. To show how small that shed was, the museum has an outline of the 10-by-15-foot shed traced on a floor along with the oldest Harley-Davidson in the world. Standing in its glass case, Harley-Davidson Serial No. 1 is said to be the first motorcycle rolled out of that shed in 1903. “Here we are 115 years later and that dream of my Davidson relatives and Bill Harley is still alive and going strong,” says Bill Davidson, museum vice president. The first Harley-Davidson motorcycles were made available to the public in 1903. The business survived the Great Depression, World War I and World War II. Before long, that shed was replaced by a much larger building, which is now the present-day site of the company’s headquarters. Some of the earlier bikes were used to deliver anything from mail to milk. On display also are motorcycles used by police and military units. The museum also houses the world’s largest collection of unrestored Harley-Davidsons, looking as they did the day they came off the assembly line, plus customized bikes that are more like works of art. 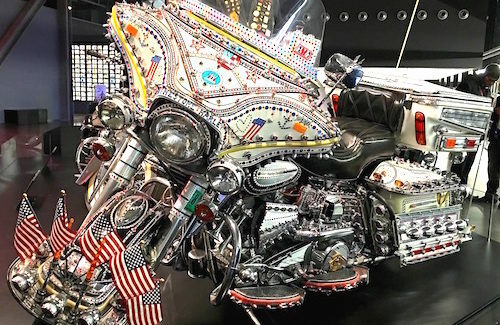 A real dazzler is Russ and Peg Townsend’s rhinestone Harley. Starting with a full-dress Electra-Glide Harley, Russ spent hours putting on red, white and blue rhinestones. I can imagine what it must have looked like rolling down the road in the glittering sunlight. Price $903. Payments $50 a month. On the sales application, Elvis listed his occupation as “self-employed vocalist.” The motorcycle dealership must have figured this young singer might not be the best risk. But they took a chance. Of course, this was before Elvis became known as The King and could buy almost any vehicle he wanted. One of the most poignant stories is a rusted 2004 Harley-Davidson Night Train motorcycle with Japanese license plates. The bike was found in April 2012 by a beachcomber in Canada. Peter Mark stumbled upon a large storage container on an isolated beach in British Columbia. Returning to collect his find three weeks later, Peter discovered that the shipping container was gone and the Harley itself was half buried in the sand, corroded by the tide’s ebb and flow. Harley-Davidson folks were able to track down the bike’s original owner thanks to its still-intact Vehicle Identification Number. The motorcycle had amazingly survived through a more than 4,000-mile journey across the Pacific when it was washed away during the devastating tsunami that struck Japan on March 11, 2011. Because the contaner was insulated, it was buoyant and floated for more than a year on the current from Japan to the Canadian Coast. Since restoration of the bike would have meant that 99.9 percent of it would need to be replaced, the Harley-Davison company offered to give Japanese owner Ikuo Yokoyama a brand-new bike. He declined, saying he didn’t want to profit from a catastrophe that had cost him and others their loved one and their homes. Instead, Ikuo Yokoyama requested that the motorcycle be put on permanent display at the museum as a memorial to the tragedy that claimed more than 15,000 lives. The 20-acre site also has a restaurant, the Motor Bar & Restaurant, featuring popular items like burgers, chili, barbecue, chicken, ribs and a Wisconsin fish fry every Friday. The restaurant also offers beer, wine and cocktails, including the Easy Rider – seven different liquors with a bit of kick from Jim Beam’s Devil’s Cut Bourbon Whiskey. The Can Room offers snack food and more than 55 different local and national canned craft beers. Before leaving the museum, most visitors pull out cameras or cellphones in the “Experience Gallery” where visitors are invited to climb aboard a Harley and imagine what it’s like to zoom down the highway.